Hello again. If you haven’t checked out Attending Colossalcon 2016, Part 1, please do so now. Part 1 covered my Colossalcon experience on Thursday and Friday, while this post covers Saturday and Sunday. I didn’t elaborate on this before, but I did see a few longtime friends while at Colossalcon. Sure, I met plenty of new folk, but Colossalcon was special because I was able to spend it with people I hold dear. We could geek out, take control of photo shoots (as explained later), and munch on emergency granola bars. My good friends. A Pokemon trainer and her Pokemon. I know I said I didn’t eat, and for the most part I didn’t, but one night, I was able to have dinner with a friend’s family in between panels. We had a spaghetti dinner and moose tracks ice cream for dessert. What could be better? I even spoke with my friend Rena about possibly doing a panel next year (and cosplaying together). Met up with a few friends. Stars Wars and Sword Art Online?! Yes, please. By the end of the weekend, I was tired but I was satisfied. Now, I know I said that the Final Fantasy shoot was one of the best I attended during Colossalcon and, don't get me wrong, it was fabulous. 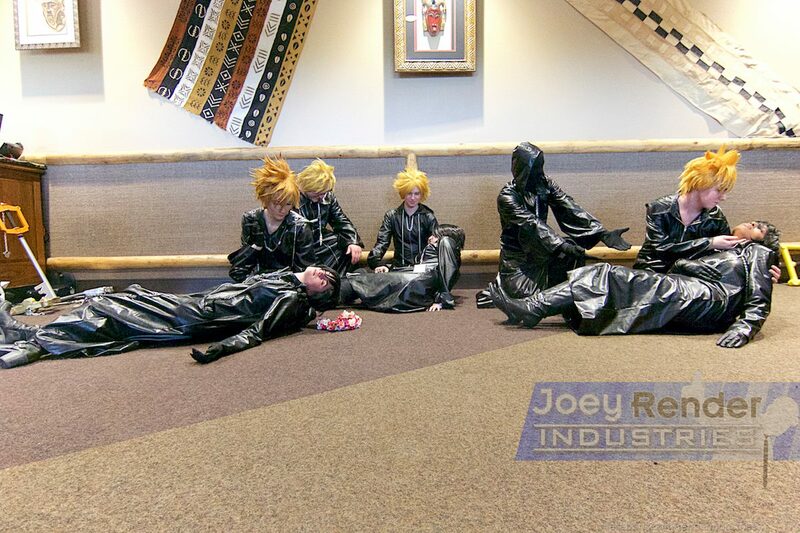 But Kingdom Hearts, hands down, was the best photo shoot I’ve ever seen in my life. I think I might have started crying midway. It didn’t start out that way, though. Alas, it wasn’t so simple (and clean). Now, you should know that during the entire weekend, it hadn’t rained at all. Yup. We were lucky. It was hot, though. And there was a chance of rain in our future. At the exact moment that the Kingdom Hearts (KH) photo shoot was about to begin, it started to pour. I convinced myself I didn’t care. 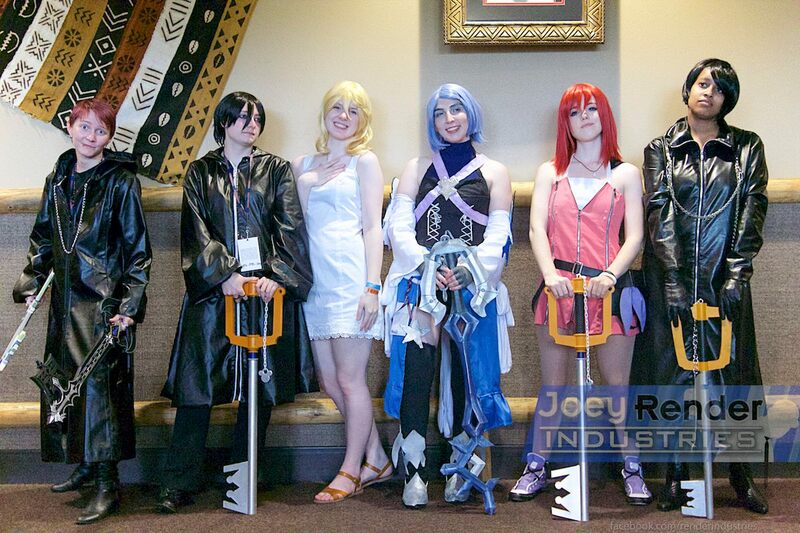 I would march out into the rain and see all the KH cosplay splendor that was before me. 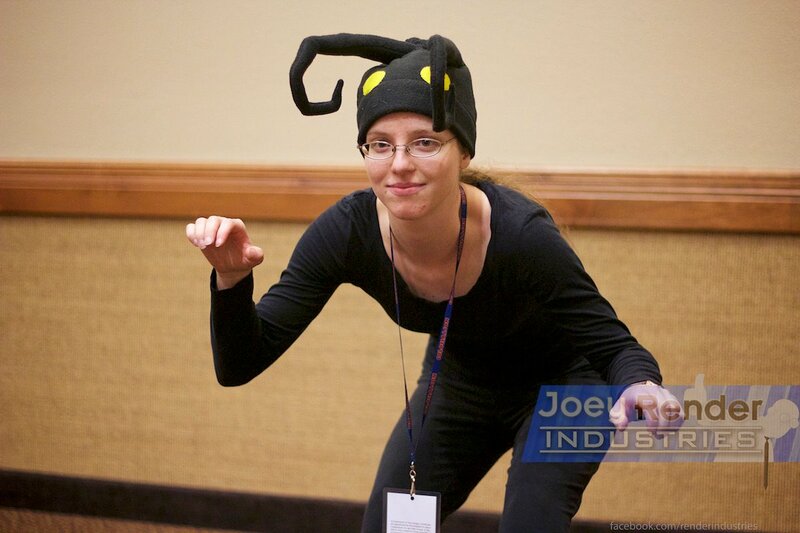 Plus, one of my really good friends had dressed up as a heartless. Couldn’t miss that. Look how adorable she is! But Joey, one of my oldest and best friends (and the amazing photographer from Joey Render Industries), had the bright idea to ask the Kalahari Staff if we could use their lobby for the shoot.They agreed! 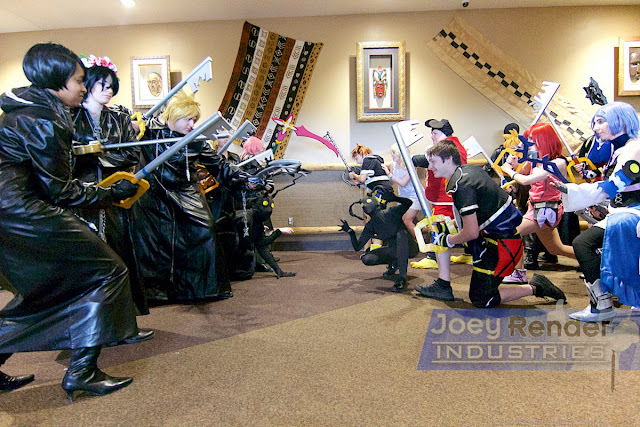 So, the only Aqua (who, along with Joey, took charge) led the cosplayers up the bridge to the lobby in a KH parade. Girl power! Female Kingdom Hearts characters for the win. Once there, we began the shoot. Of course, we had a group shot, then there were shots of various characters (there was one shoot where they had all versions of Sora...yes, that included Namine), and lots and lots of requests (a bunch of them made by yours truly). There wasn’t enough time to do all the requests I wanted. (I know, I’m KH crazy.) 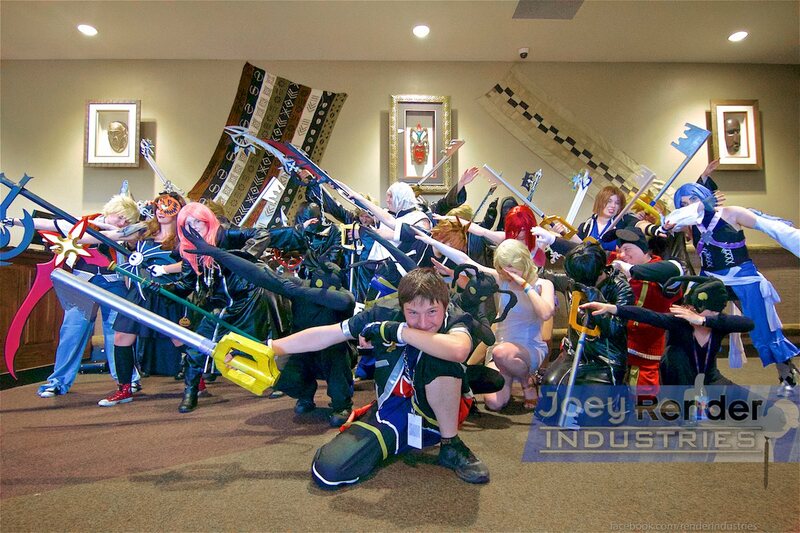 But one of the best shots was when everyone did the dab, Keyblades and all. "Who else will I have ice cream with?" Be still my fangirl heart! I’m not sure why, but most of my favorite panels were on Saturday. One of these panels was Sailor Moon related (Moon Prism Power, Make up! The Legacy Continues). It was basically the history of Sailor Moon, and anyone who knows me wouldn’t be shocked at all that I had enjoyed this. What was interesting about it was that it offered information about both Sailor Moon and Sailor Moon Crystal. 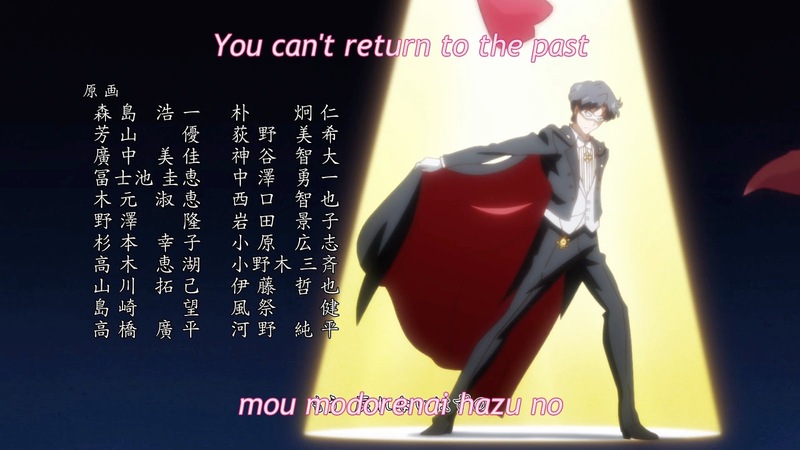 They even mentioned that one Sailor Moon Crystal ending featuring Tuxedo Mask. (If you haven’t seen it, it is absolutely hilarious. Definitely had some fan service included.) I will wholeheartedly admit that Tuxedo Mask was my first crush. *sigh* You still bae, Mamo Chan (Darien, hehe). If you're interested, watch it here. But oddly enough, my favorite panel wasn’t one I had planned on going to in the first place. In fact, it was a way to kill time while I waited for friends. Ahem, it may or may not (it was, it definitely was) have been rated for those 18 years and older. It was called (bear with me) Dorito Pope’s GAMEOCALYPSE 2016: The End is Nigh. Now, before you question my sanity (eh, I’m probably crazy anyway, so go right ahead), let me explain. You’re probably wondering, what the heck was that panel about? Well, to put it briefly, it was a video game panel. More specifically, it was a panel on the future of video games (and also shamed you for whatever game you were looking forward to). And of course, all the games I’ve been waiting forever to play (Kingdom Hearts 3, Final Fantasy XV, Final Fantasy VII, Persona 5, etc.) were all shamed in glorious fashion. Literally, he shamed them one right after the next. But there was something different about this panel. It was a gaming panel, yes, but it was set up like a church service. Yup, you heard me right. Dorito Pope had a Mountain Dew bottle staff and a hat in the shape of a curled Dorito. Dorito Pope was there to predict the gaming future and, my, do I wish I had more room to explain to you everything he spoke about. But just imagine the experience: a guy up front shaking a bag of Doritos, Dorito Pope baptizing people in Mountain Dew, and everyone shouting Hallelujah whenever Dorito Pope answered a question. I can’t make this up. But the funniest thing was that he shamed ALL (not some...all) of my most anticipated games. Oh, Dorito Pope. Goodness me. Again, pretty bad but necessary all the same. There was a Disney photo shoot. Everyone looked amazing, I will say that. However, there wasn’t really anyone there who knew how to organize it. Although, it should be said that Disney is extremely large and owns not only its original animated movies but Marvel, Stars Wars, and an assortment of other things. So, I can’t really fault whoever was in charge for not having it all together. But the reason why this photo shoot was somewhat of a fail was because there wasn’t enough time scheduled, and they organized it in such a poor way. They had Disney movies go up one at a time. It should have been broken down into categories, such as: Pixar, Classic Disney, Golden Age Disney, New Disney, etc. But we live and we learn. It also didn’t help that it began to rain around this time...so, yeah. The con had to end...and I had to say goodbye to all my lovely friends, had to watch as Colossalcon dwindled to a few cosplayers. It was a sad sight, indeed. Look how sweet! It's Luna and Noctis from Final Fantasy XV. All and all, I felt renewed, I felt a part of something bigger, and my euphoria lasted the entire weekend. The fandom culture was outstanding. The art was beyond this world. I've collected a few things that I’ve hung up or placed in a safe spot at my work desk in the library. I’ve even showed my teens the Free! Iwatobi Swim Club water container. Those who have seen the anime will know having Free! characters on your water container is pure perfection. Speaking of Free!...look, it's Haru. The Flea Market was on Sunday, so I was able to get a few trinkets and a potential Silver Crystal for a future Sailor Moon/Neo Queen Serenity cosplay. Honestly, I’ll be back next year and hope to see some of you guys there too. Will you be going to Colossalcon 2017?